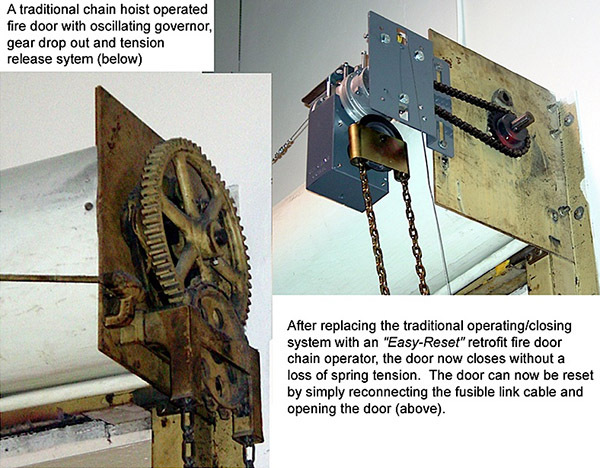 Commercial Doors Direct Retrofit Fire Door Operators upgrade existing fire doors to state-of-the-art chain, crank or motor operator systems providing superior descent control and "Easy-Reset" or "Auto-Reset" functions (available for most types and brands of fire doors). 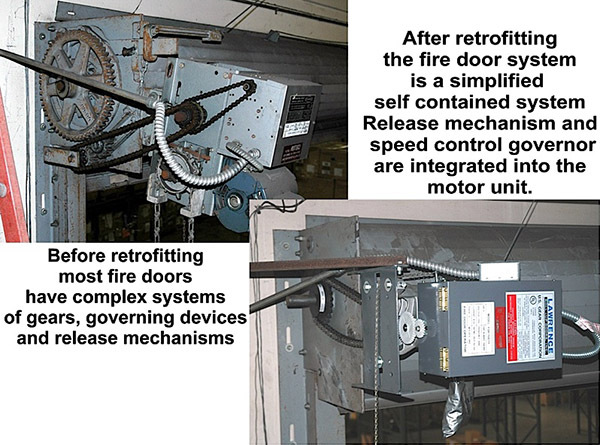 NOTE: Retrofit fire door operators may not be the proper solution to all causes of improperly operating fire doors. Comercial Doors Direct reserves the right to refuse to sell a retrofit operator in any case where it is deemed to be not appropriate for the intended application. Fusible link activated closing through the operator’s internal release and governor. To reset, reconnect the fusible link cable and open the door. Time delayed closing upon alarm/detector activation, and failsafe closing upon a loss of power, through the operator’s internal release and governor. To reset, clear the alarm, restore power, reconnect the fusible link cable, and open the door. Time delayed closing upon alarm/detector activation, and failsafe closing upon a loss of power, through the operator’s internal release and governor. To reset, clear the alarm, restore power, and open the door. * Hand chain or removable awning crank handle is used to open the door – convenient pull cable is used to close or stop the door at any position. A locking handle release in a surface or flush mount enclosure can be optionally provided to prevent unauthorized closing. 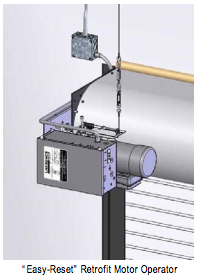 Time delayed failsafe closing through the operator’s internal release and governor upon a loss of power, or failure of the sensing edge upon alarm activated motor controlled closing. 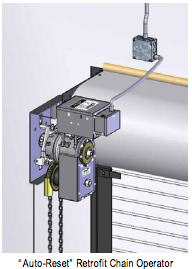 NOTE: “Easy-Reset PLUS” and “Auto-Reset” options for chain and crank operators are field installed operator mounted modules. Field wiring to a detector/alarm dry contact and 115vac power source is required. They also allow for fusible link release if required by the Authority Having Jurisdiction, but if activated will require reconnection of the fusible link cable to reset.